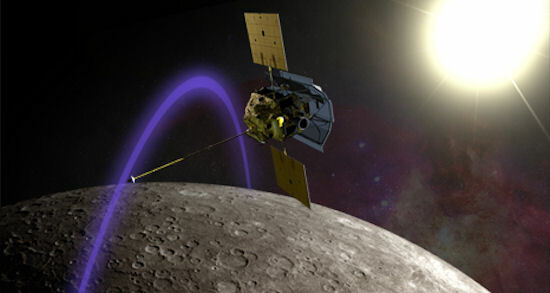 "This mission will continue to revolutionize our understanding of Mercury during the coming year," said NASA Administrator Charles Bolden, who was at MESSENGER mission control at the Johns Hopkins University Applied Physics Laboratory in Laurel, Md., as engineers received telemetry data confirming orbit insertion. "NASA science is rewriting text books. MESSENGER is a great example of how our scientists are innovating to push the envelope of human knowledge." At 9:10 p.m. EDT, engineers Operations Center, received the anticipated radiometric signals confirming nominal burn shutdown and successful insertion of the MESSENGER probe into orbit around the planet Mercury. NASA's MErcury Surface, Space ENvironment, Geochemistry, and Ranging, or MESSENGER, rotated back to the Earth by 9:45 p.m. EDT, and started transmitting data. Upon review of the data, the engineering and operations teams confirmed the burn executed nominally with all subsystems reporting a clean burn and no logged errors. MESSENGER's main thruster fired for approximately 15 minutes at 8:45 p.m., slowing the spacecraft by 1,929 miles per hour and easing it into the planned orbit about Mercury. The rendezvous took place about 96 million miles from Earth. "Achieving Mercury orbit was by far the biggest milestone since MESSENGER was launched more than six and a half years ago," said Peter Bedini, MESSENGER project manager of the Applied Physics Laboratory (APL). "This accomplishment is the fruit of a tremendous amount of labor on the part of the navigation, guidance-and-control, and mission operations teams, who shepherded the spacecraft through its 4.9-billion-mile journey." For the next several weeks, APL engineers will be focused on ensuring the spacecraft's systems are all working well in Mercury's harsh thermal environment. Starting on March 23, the instruments will be turned on and checked out, and on April 4 the mission's primary science phase will begin. "Despite its proximity to Earth, the planet Mercury has for decades been comparatively unexplored," said Sean Solomon, MESSENGER principal investigator of the Carnegie Institution of Washington. "For the first time in history, a scientific observatory is in orbit about our solar system's innermost planet. Mercury's secrets, and the implications they hold for the formation and evolution of Earth-like planets, are about to be revealed." APL designed and built the spacecraft. The lab manages and operates the mission for NASA's Science Mission Directorate in Washington.